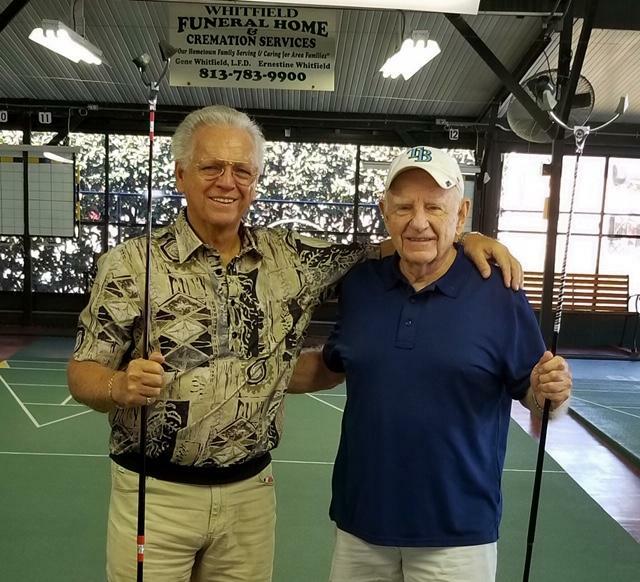 Zephyrhills Shuffleboard Club members Chuck Moulton and Merv Lambe won the Central District Pro/State Amateur Draw tournament championship 2/8 at ZSC. Chuck and Merv had a tough time getting through many of their five matches. All but one went 3 games and some came down to the last shot. In the semi-final match, Moulton and Lambe were down by 50 points with only 8 frames to go and were able to pull out the win. The final match was an exciting nail biter. With Moulton and Lambe up by only five points in the last frame of the 3rd game, Lambe made a perfect high 10 to keep the opposition from scoring on their final shot.